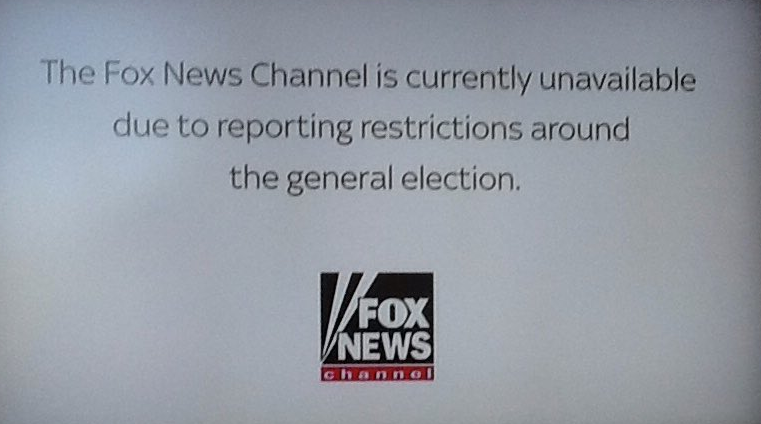 The blackout of Fox News in the UK on Election Day triggered allegations of unfair censorship of media. Last week, a516digital reported how Fox News would be unavailable due to Ofcom restrictions on reporting and discussing election issues on polling day. The article sparked strong opinion on social media and was linked to on sites such as Reddit. Some blamed Ofcom for the blackout and cited it as an example of state censorship. 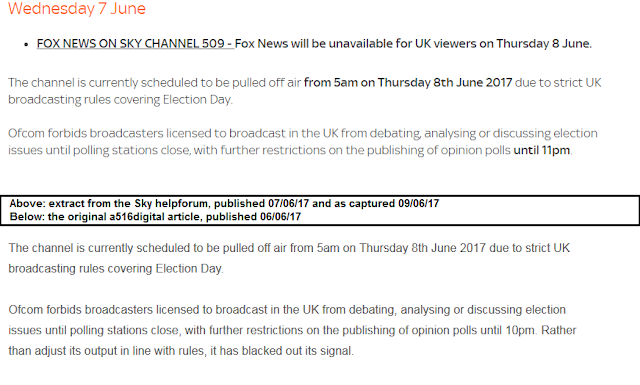 The blackout had a history: Fox News had been found guilty of breaching Ofcom rules restricting reporting on polling days before, during last year's EU referendum. This time round, the feed on Sky was blocked from 5am, and replaced by a slate confirming its unavailability. But was this censorship? And who censored whom? Ofcom does forbid broadcasters licensed to broadcast in the UK from debating, analysing or discussing election issues until polling stations close, but provides guidelines so broadcasters know what can and can't be said while voters vote. Despite concerns that foreign broadcasters giving airtime to commentators voicing strong opinions for a particular cause is a form of foreign interference in UK affairs, these channels are allowed to broadcast in the UK as part of a broadly open news environment. Most foreign broadcasters with a UK broadcasting licence respect UK broadcasting regulations by simply switching the UK version of their feed to a slate or caption when an item that would breach Ofcom rules is being aired. This generally only lasts for the duration of the item, after which the programme continues to air as normal. Such arrangements are also common for legal reasons, for example during the Olympics, anything Olympic related may be blanked out in countries where the foreign broadcaster does not have rights to show footage. Alternative arrangements include foreign broadcasters substituting a programme for another one that will not be affected by restrictions, or adapting their content to avoid such issues: for example, during polling day brief factual statements about turnout, weather conditions that might be affecting voters and details about politicians turning up to vote are permitted - the debating, reporting and discussing of each side's campaign is over, it is up to voters make their decision. 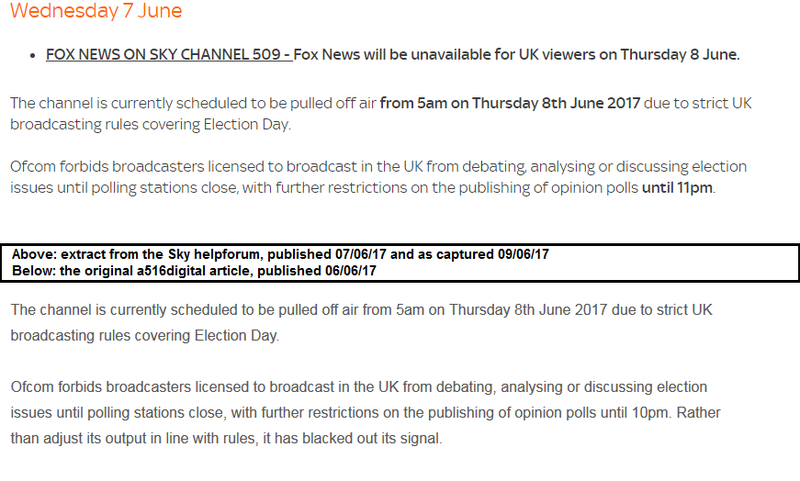 Instead, the people in charge of Fox News' output in the UK chose to make the channel completely unavailable from 5am until 11pm, an hour beyond the 10pm lifting of Ofcom restrictions, the point in time when broadcasters are permitted to discuss exit polls and analyse the impact of the election, thus ensuring there would be no repeat of last year's breach of rules. Some still saw the event as an example of state censorship, implying that Fox News should have continued to be available. This however, would have been the same as giving a channel special dispensation above other UK licensed channels, such as Sky News, who abided by the broadcast rules and who continued to be broadcast during election day. Sky's customer helpforum, which copied part of the a516digital article without attribution, amended part of the paragraph citing Ofcom rules, changing 10pm into 11pm. This slight edit gave the impression Ofcom rules apply until 11pm, justifying the period of unavailability: in fact, and as proven by the BBC, ITV, Channel 4 and Sky News starting their coverage before then, the Ofcom restrictions lapse at 10pm. Fox News stayed off until 11pm, although full coverage of the Elections would have been allowed from 10pm.